Aquaman is a 2018 American superhero film based on the DC Comics character Aquaman, and distributed by Warner Bros. Pictures. It is the sixth installment in the DC Extended Universe (DCEU). Directed by James Wan, with a screenplay by David Leslie Johnson-McGoldrick and Will Beall, from a story by Geoff Johns, Wan and Beall, it stars Jason Momoa as the title character, with Amber Heard, Willem Dafoe, Patrick Wilson, Dolph Lundgren, Yahya Abdul-Mateen II, and Nicole Kidman in supporting roles. Purchase AQUAMAN on Blu-ray Today! AQUAMAN washed ashore in December of 2018 to a great box office success. It seems quite obvious given the intake that there will most certainly be another AQUAMAN movie. The effects and cgi is amazing. The action is packed to the brim. However it did feel like the movie lacked a more serious tone. One thing that I was always fond of the DC Universe typically having. Gone is that so it seems. Perhaps the upcoming The Joker will bring that back. The movie opens up to a pretty great submarine scene that most all saw in the trailers by now. With this we get the beginning of what will end up being the origin so to speak of Black Manta. We get history of why he wants his vengeance later on. The film shows us an enchanting Atlantis, but seems to cram a lot into one movie. It felt all over the place at times. Jason Momoa does a great and believable job at Aquaman however and Amber Heard is definitely easy on the eyes. I think for the most part fans know what they are getting into with this Aquaman film no different then a lot of the DC movies that didn’t get the best of ratings. Much like Captain America First Avenger the film was good enough for an origin and allowed a lot to be built upon for the upcoming sequels. That is my hope for the future Aquaman sequel to come. 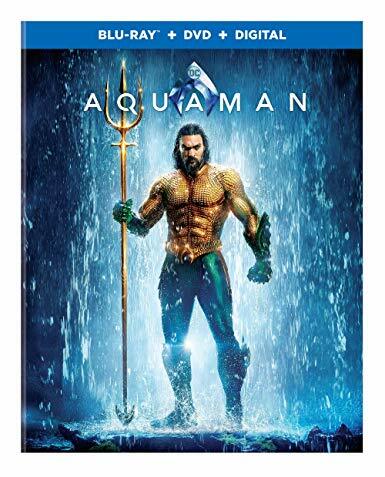 AQUAMAN comes to blu-ray disc with a great 1080p transfer that looks mightily impressive, and only makes me wonder how great the 4k Ultra HD Blu-ray must be. In the vast wonders of the sea and Atlantis we get the opportunity for many brights and murky colors all to shine through in HD bliss. Then the town scenes with action galore also allow for the picture quality to shine. No one will have complaints about the picture quality unless they are just being sticklers. The special features for Aquaman are listed below and also contains a digital copy with MoviesAnywhere.